The title of this autobiographical collection is drawn from the official definition ‘British Protected Person’ given to Achebe upon his birth in Ogidi village in colonial Nigeria. 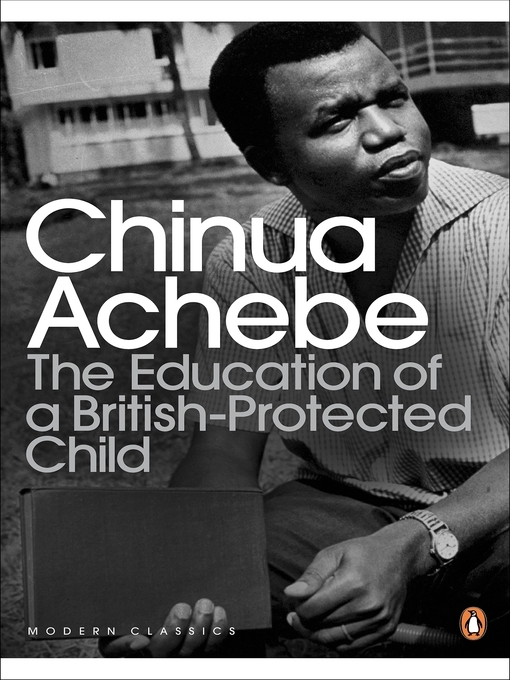 In the first chapter, which shares the same title as the book, Achebe recounts growing up in a colonized country and his abiding memories are of the English stories he was told and the English songs he sung in his schooldays; one of them in particular he recalls in support of the British Army during World War Two. He recalls his Christian upbringing in a village where many still followed the traditional belief systems and his childhood reflections expose the juxtaposition between this and the traditional festivals he observed as an outsider. Achebe felt that he occupied what he terms the ‘middle ground’. Using an Igbo proverb to illustrate his position ‘Obu-uzo anya na afu mmo, Ono-na-etiti ololo nwa, Okpe-azu aka iko. (The front one whose eye encounters spirits, The middle one, the dandy child of fortune, The rear one of twisted fingers), Achebe, perhaps surprisingly, expresses that his position - with the future to head in to - and the past to fall back on - was indeed a fortunate one. Throughout the essays that follow there is a reflection on each of his sense of occupying a middle ground between pre and post colonialism and it is apparent that it is this position that gives Achebe the balanced tone that he sustains even when expressing an oppositional point. In his brief essay ‘My Dad and Me’ it becomes apparent how the dichotomy between traditional and imported religions was evident through his own family history. Achebe’s father was raised by a maternal uncle named Udoh who hosted the first missionaries to arrive in his village. Refusing conversion from traditional belief systems himself, Udoh did not prevent Achebe's father from asking questions and he went on to be educated in a missionary school. Achebe expresses his gratitude to the gift of education his father bestowed upon him and ultimately a gift that Achebe has extended to all of his readers. In each essay there is an implicit scrutiny of Achebe’s relationship to <?xml:namespace prefix = st1 ns = "urn:schemas-microsoft-com:office:smarttags" />Nigeria during each life event, this informs the main narrative of the book. In the essay ‘What is Nigeria to me?’ Nigeria is compared to a child ‘gifted, enormously talented, prodigiously endowed, and incredibly wayward’. Although he never shies away from the problems that Nigeria has and he is vocal in his criticism of leadership of the country, Achebe’s criticisms are perceptibly painful and are tempered by his overt affection for his country and the continent of Africa. In 'Africa’s Tarnished Name', Achebe reflects on the litany of writing and other art forms that proliferated the perception of ‘alienness’ which seeped into the western consciousness and that Africa came to represent. Achebe is particularly scathing of Joseph Conrad’s Heart of Darkness but he also takes time to restore the balance with his reflections on positive representations of Africa and Africans. Achebe recognizes the care, respect and human dignity afforded to the subject in Thomas Gainsborough's 1817 portrait of Ignatius Sancho. The role of art and literature in changing the perception of a whole continent is a recurring theme in Achebe’s essays. In 'Politics and Politicians of Language in African Literature', Achebe claims that ‘‘of all the explosions that have rocked the African continent in recent years none have been more spectacular and hardly any more beneficial than the eruption of African literature." ‘Nowhere is the difference more stark and startling than in the ability to ask a parent: "How many children do you have?" The right answer should be a rebuke: "Children are not livestock!" Or better still, silence, and carry on as if the question was never asked’. However Achebe clearly relishes the opportunity to share some of his parenting insights and fatherly pride with his readers. As a seasoned Achebe reader might expect, the activist is always lurking below the surface and in ‘Traveling White' - a piece that is a challenge to racism, the author recalls his experience of traveling on a segregated bus in Rhodesia. In the final chapter 'Africa is People’, Achebe calls upon the World Bank to drop so called third world debt. In a rallying cry he declares "we rise above the animal together or not at all". I picked up a copy of The Education of a British- Protected Child shelved in the biography section of a local library. Through this collection of essays penned between 1988 and 2009 Achebe reflects upon growing up in colonial Nigeria, his love-hate relationship with the post independence Nigeria, his own education and writing and the writing of others from inside and outside of Africa, his own exile and family. Achebe is outspoken both against and in defence of his country, which he loves passionately but frustrates him endlessly, this sense captures his comparison of Nigeria to that of a child. Achebe is an engaging and funny storyteller; measured, mature, measured and exceptionally wise. His perspective can be applied to life in any country or any family and I found myself nodding in agreement and itching to 'tweet'; and share with my friends a new insight or saying from every single page. I hope to remember the Bantu proverb cited by Achebe in Africa is People "Umuntu ngumuntu ngabantu" translated as "a human is human because of other humans". It is the focus on humanity that makes Achebe’s work so accessible to readers all over the world. Lisa J. Long lives in Harrogate, England.